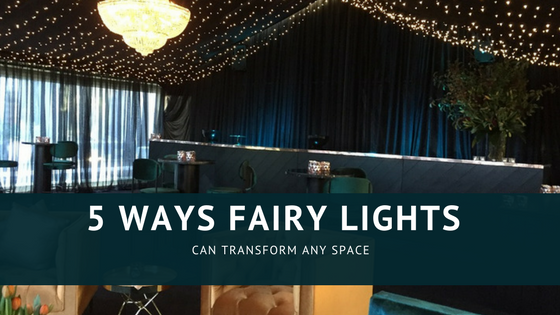 Fairy lights are still enjoying their moment in the sun, with more and more people utilising these versatile bulbs in everything from day-to-day decor through to lavish events and parties. They’ve become particularly popular staples when it comes to wedding lighting, due to their unique ability to transform any space into a romantic wonderland. If you’ve got an event coming up, no matter what the scale, consider these new ways to incorporate the glistening lights into your decor. Any plants, whether contained neatly in a pot indoors or lined up in outdoor boxes, can be illuminated and made into a feature piece with the help of a few fairy lights. Place small planter boxes wrapped in glistening bulbs in windowsills to create a romantic, reflective display. If your wedding is an evening affair, string lights along the aisle to help illuminate your big walk. These can be assembled on the chairs next to the aisle, or on the ground of the path itself. Just make sure to use outdoor bulbs to prevent damage. Rather than flowers, let lights take centre stage on dining tables at your event. Fill large glass vases or jars with coiled lights, creating a glowing statement item for each table. Light up entranceways with sparkling strings of lights intertwined in archways or strung up around doorways. This not only helps direct guests to certain areas but also adds a touch of whimsy to your special day. Long tables, such as the bridal party’s dining table, could easily be transformed with the help of a few bulbs. Rather than buying a fabric table runner, create your own unique and memorable version with fairy lights. To help ensure that your next event goes off without a hitch talk to the team at Pro Light & Sound today!